BBC released a story today that may be leaving some people concerned. 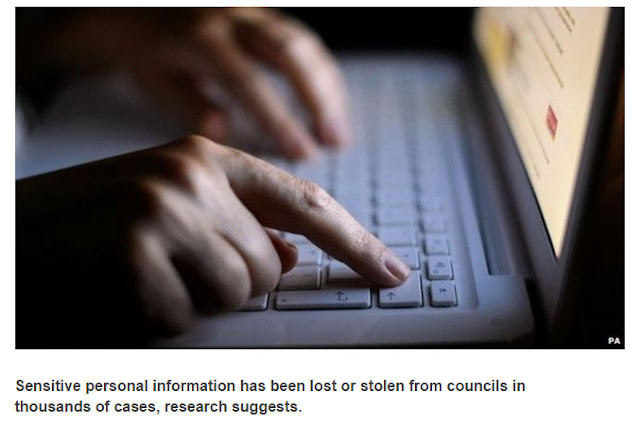 It has reported that a surprising number of Local Authorities have a ‘lax’ approach to their data security, data that may include important or confidential information, that has subsequently been ‘lost or stolen’. The findings mention 4236 data breaches during a 3 year period from 2011, such as 5000 letters that were sent to the wrong address which included content for another recipient. Most shockingly, 197 mobile phones, computers, tablets and USB’s were again, lost or stolen. The wealth of private information on all of these devices is tricky to comprehend, particularly if you consider the reliance we place on our personal devices for storage nowadays. With the demand for flexible working and the increasing pressure placed on workforces, mobility has become a global phenomenon, with advances in technology being the catalyst. It enables increased productivity, speedy communication and a better work/life balance. It’s no wonder that organisations both in the Public and Private Sector are keen to jump on the band wagon. But of course, despite the benefits, there are many risks associated with deploying mobility, the main being the complete lack of control. Once data has left the confines of your organisation, in any form, it’s nigh on impossible to get it back. This becomes particularly damaging when said data is confidential and personal. Hence the ‘deeply disturbing’ situation within a few of our Local Authorities at the moment. It’s these issues that make the deployment of mobility a long term consideration. Of course, at the rate in which technology is developing, mobility will become a necessity for all organisations who want to stay afloat. But for those who are considering mobility, and those who have already taken the plunge – what’s the solution? The Enterprise Mobility Suite, powered by Microsoft, is an effective management solution that eradicates the issues surrounding mobility. It gives you back the control of your mobile workforce enabling you to deploy mobility with confidence. It’s also perfectly suited to the Public Sector – namely Local Authorities – who need heightened security features to protect their OFFICIAL documents, such as the ability to remotely wipe compromised devices. So, the moral of the story? Keep up and embrace mobility. But make sure you’ve installed a comprehensive management solution alongside it. You don’t want your data ending up in the wrong hands.